From what one hears about Tom Rob Smith’s best-selling book Child 44, the first in a trilogy of books by the same author, it’s a gripping and intelligently plotted piece of crime fiction amidst a historical totalitarian context. It’s a shame, then, that none of that is present in the film adaptation. Director Daniel Espinosa (previously at the helm for Denzel Washington action flick Safe House) cannot seem to wrap his finger around any of the intrigue and potential that the plot suggests; a series of child murders is to be investigated in an environment where murder is believed to be “a Capitalist disease” and anyone who says otherwise is swiftly taken away by the Secret Police. There’s definitely something within that story that offers great commentary on the paranoia and pride of Communist ideals and practises, but Espinosa doesn’t seem to dig deep enough towards the core to unearth it and instead presents a jumbled collection of dirt-ridden findings that don’t explore these ideas as much as they should. At 137 minutes, it is far longer than it needs to be; there are numerous characters, sub-plots and sequences that Espinosa could have removed from the final product and nothing would have been deducted from the overall plot, but unfortunately they remain. None of them are even interesting and add very little to the overall arc, like Jason Clarke’s brief appearance nearer the start of the film as a fugitive who would rather stab himself in the stomach than be taken by the authorities – you keep wondering if what he says and does will come back at any point to haunt any of the main characters, but he’s gone as quickly as he came which in turn makes his a mostly pointless contribution to the story. Various other sub-plots, including Tom Hardy’s MGB officer Leo Demidov being conflicted with the order of denouncing his wife Raisa (Noomi Rapace) as a spy, or the latter’s apparent friendship with a fellow teacher (Nikolaj Lie Kaas), or anything that happens once Leo and Raisa are banished to a lesser part of the country once he refuses to denounce her, are also unworthy of such focus and could have benefited from either heavy trimming or complete dismissal. There’s also a very brutal approach to the film’s violence; sure, there’s bloodshed and death all around, including uncomfortable descriptions of the dead children that are found, but it’s handled by Espinosa in a way that isn’t exactly tasteful or pleasant. Now, we understand the idea that this is meant to be a brutal depiction of the 50s-era USSR, and that’s a fair enough approach but it needs to be in a way that an audience can get behind – if it wasn’t exceptionally boring, which unfortunately the film is, then it would be fine because we would care about the story and the characters it was happening to, which unfortunately we don’t. Despite standard work from what is honestly a fantastic ensemble of actors, they are let down by a script that doesn’t let them be characters in their own right that are interesting or worthy of following, let alone for over two uninteresting hours – and that’s not even touching upon their ridiculous Russian accents, leaving them sounding more like Borat clones which just adds insult to injury. Perhaps, with all things considered, Espinosa wasn’t the right director to bring this particular story to life. By stripping most of its humanity away and just presenting the crime as a crime that needs to be solved, he’s turned the story which probably reads much better as a book than a film into a cold and brutal depiction of an era we already know was a cold and brutal era, so it says nothing that interesting about that either. This guy doesn’t know whether the film should overall be a crime thriller or a commentary on Stalin’s politics, and as a result conveys both poorly. 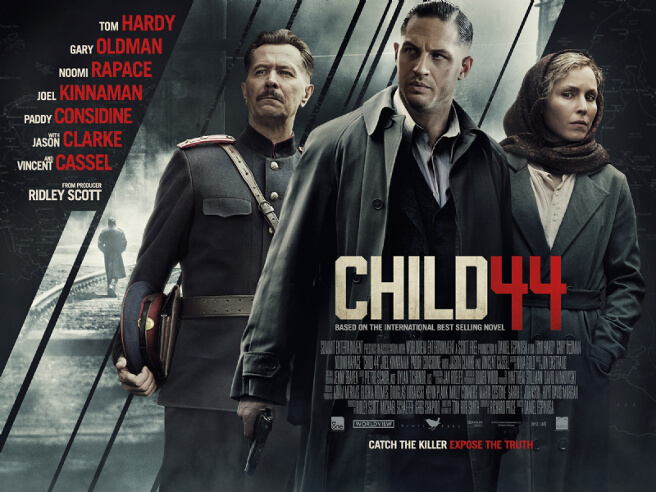 It’s a shame, because Child 44 – from what we’ve heard, anyway – is a fascinating read and a story that deserves a better on-screen treatment than this. The worst thing a story like this can be is boring, and unfortunately that’s exactly what it is; a boring, bloated and brutal State secret. Child 44 does nothing with its potential, instead turning in a deathly boring, uncomfortably brutal and painfully overlong crime thriller that squanders its fantastic cast with uninspired direction and dodgy accents.